Another tourist entry before we get back to really important things. I am sure that I am not the first gringo who has had a bit of trouble coming to terms with Day of the Dead, the three-day holiday just past here. Having run the gauntlet of the thing only once, here is my very subjective take on it. I recall as a young child the routine on Memorial Day weekend in the bush of Iowa. My parents would load up the trunk of the car or the back of the pickup with freshly cut flowers, some cans, and a big jug of water. We would then drive around to cemeteries, at each stop placing cans of flowers on the graves of dead relatives, filling up the can with water, and taking off for the next cemetery. We would spend the morning doing this, and that would be that. The time this took depended on how many people there were in the cemeteries that my parents knew, but we were usually done by early afternoon at the latest. A Pátzcuaro cemetery being readied. First and foremost, Day of the Dead here is a very intense Memorial Day. Families go into the cemeteries and spend a good part of the day and the night there with the graves of their loved ones. There is one little exception to this. During a certain time period during the holiday, only women and children stay with the graves. Still, the simple fact is that the cemeteries are full of people at night. posed for me at a sidewalk café. There is a dash of Halloween added to this. Many people wear costumes. The children here do their own version of “Trick or Treat.” They are not interested in candy, however. They are interested in cash. On the walk into central Pátzcuaro, the first thing one encounters is many truckloads of flowers for sale for placement on graves. However, they are different varieties of flowers than those I associate with funerals, for example. Therefore, the fragrance of these mountains of flowers was purely delightful for me. Then there is added to this a dash of the fiesta, but only a dash. 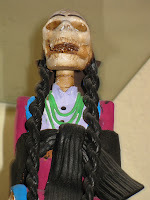 The personification of death itself is a figurine called La Catrina. The photo to the left is of a classic example. The Mexican people actually refer to death affectionately as La Catrina. This image was invented and made popular by a famous author and political cartoonist named Guadalupe Posada (1852-1913). La Catrina is always dressed in the attire of his time. 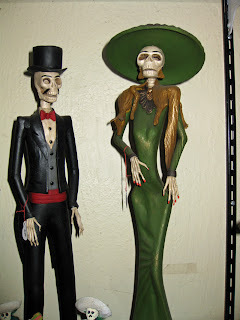 There is actually a couple, Catrin y Catrina, but nobody really pays any attention to the man. These figurines in various color schemes and various sizes are for sale everywhere. A close second in popularity are decorated skulls. A typical altar in a Pátzcuaro restaurant. Additionally, the construction of altars is important. Restaurants, hotel lobbies, and other public places feature many altars constructed especially for the Day of the Dead weekend. As I mentioned earlier Pátzcuaro is the center of the Day of the Dead celebration in México. Why? I have no idea now. However, it clearly is. We were so relieved that we were getting out of town in the early afternoon of Sunday. Outside of town on the highway, a seemingly endless line of cars was waiting to get into the city. Day of the Dead is a large thing in México, and I find it fascinating. I do not wish to wax too philosophical here. However, there is a kind of intimacy with death among these people. I am now absolutely convinced that a consciousness of death, an awareness of death, a regard for death is a part of the psyche of the Mexican people in a profoundly different way than it is among Americans. To tell you the truth, I am still mentally adjusting to this after the weekend. Fascinating stuff, Steve. I'm familiar with the commemoration of the dead from France (La Toussaint) and Germany (Todestag), but these are simple catholic holidays with no fiesta characteristics. Amazing stuff. This was advertised on UK TV a few weeks back by some travel firm running special trips out there for this dead thingy. Those two skulls are impressive. Other cultures can be truly inspiring at times. As an undergrad I took a course on Mexican Art History. What you said about the presence of death in the Mexican psyche and culture was often remarked on. Bloggerboy, this coincides with All Saints Day of course. Therefore, it is very Catholic. However, as with so many things here, the religious practices of the pre-Columbian indigenous people is all mixed in with the Catholic practices, which is what makes it so distinctive. Ruthie, your note is comforting in the sense that I feel a bit vindicated in my own reaction. I am not totally nuts. On the other hand, I do not wish to take credit for any exceptional perceptiveness. There is nothing subtle about this different attitude toward death here. Four Dinners, you have put your finger on the very reason that I am still here. I am fascinated with this culture, and I have only scratched the surface. The damned place has seduced me. Great photos. Love this celebraton. 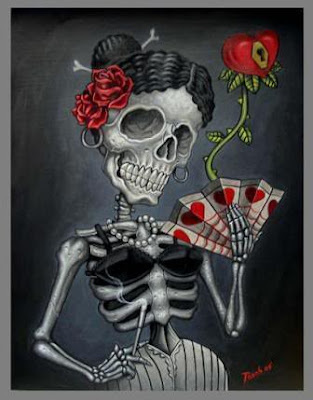 La Catrina is also like a "memento mori"...as much as death itself. She represents that even the rich Victorian fancypants women who strolled through Mexico were subject to death and it's workings. Pride is a false sense of ego...when in truth we all become equal in death. It is quite significant she is a Victorian upper crust person. The death of the ego is related in some ways metaphorically to real death. Our egos might prevent us from seeing the world and ourselves as we appear to others or in reality. We take pride in our material things yet...death sees us all the same. In this way...the notion of death to the ego is a beautiful thing...and to be aspired to within our lives.